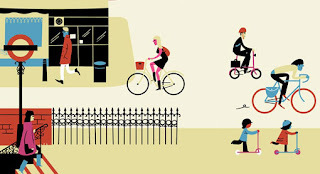 London Transport Museum and the Association of Illustrators are delighted to announce a call for illustrations featuring cycling as an emerging mode of transport in London..
Students and professionals are invited to submit entries that demonstrate the environmental, health and/or recreational benefits of cycling. It is the task of entrants to create an illustration that shows cycling as a fun and efficient way to get around the city. The top three entries will receive a monetary award and may be used in an advertising campaign for cycling. The top 50 entries will be displayed in an exhibition at the London Transport Museum that will open in summer 2010 in conjunction with the launch of TfL’s cycling programmes. For more info see the aoi website. Whoever you are and wherever you look a revolution is taking place. Cycling is quickly becoming a part of the fabric of everyday life in London. During Summer 2010, Transport for London will will join the revolution with the launch of its Cycle Superhighways and Cycle Hire Schemes as well as a host of other initiatives to improve cycle safety and security. In conjunction with these programmes, London Transport Museum and the Association of Illustrators are delighted to announce a call for illustrations featuring cycling as an emerging mode of transport in London. The top three entries will receive a monetary award and may be used in an advertising campaign for cycling. The top 50 entries will be displayed in an exhibition at the London Transport Museum that will open in summer 2010 in conjunction with the launch of TfL’s cycling programmes. Cash prizes will be awarded in three levels. The competion is free to enter and you can enter as many images as you wish. Where possible use Photoshop's 'save for web' feature. Your resultant filesize should come in at under 1mb. Read the Conditions of Entry below. If you want to proceed, click the Agree/Enter button. Upload your image and accompanying text information. Please read the terms for entry carefully. You will be asked to agree to them before you can submit your images to the competition. The competition is open to all AOI members and non-members illustrators and students of illustration. Agents or colleges may only submit entries on behalf of the illustrator with the express permission of the artist. Entries will be judged by an independent committee of judges. The judges decisions regarding the award winners and entrants to the exhibition at London Transport Museum will be considered final. All those selected to exhibit will be required to provide original framed artwork no larger than A1, or high definition, high quality prints no bigger than A2. Artwork is required to be framed with simple black wood profiles fitted with mirror plates for hanging at London Transport Museum, Covent Garden from 5 July to 22 August 2010. Award winners will be named at an award ceremony to be held at London Transport Museum, to be attended by LTM invitation when the exhibition opens. Award winning copyright holders are required to grant their license to TfL, London Transport Museum and/or their affiliates for the use of their image in publicity/Advertising materials and for the possible use on posters and postcard merchandising. In the event of posters or postcards being produced for sale, the artist shall agree to receive 40% of the net profit of the sale administered by LTM. Entrants agree that their selected image and name can be published on the LTM and AOI websites. Exhibitors must collect all artwork from London Transport Museum within one week of the end of the exhibition on the 22 August. Collection deadline is Friday 27August.